As I pack up the Beach Cottage and the Garden Shed prototypes to send to their new owners, I’m feeling the tug of those days when we first built them. They are teaching samples for our first classes at the Guild School, and elsewhere. It was exciting to decide on a project, then to see Noel’s more or less final design, then watch it take shape over the next few months. But the real thrill was unveiling it to our students and fellow teachers at the school—the payoff for the months of design, finishing, and class planning and production. Their excitement energized us, propelling us out of whatever tiredness lingered from preparation and travel and into the job of showing the students how to do what we did. There was one early response that gave us pause—a student’s husband popped into the classroom as we were setting up and spent a few minutes looking at the prototype while we worked. On the way out the door he called over his shoulder, “Once again, cute as a bug!” What?! Cute as a bug?! Shoot us now, we didn’t want to be known for making “cute.” Once over the untintended bump, we used it as a kind of mantra, checking with each other to see if the finished project had that certain, bug-like quality. Over the years others have used the C word on our work, and we laugh—there’s no accounting for how people respond, or how one’s ego will be affected. Anything for a good shot. 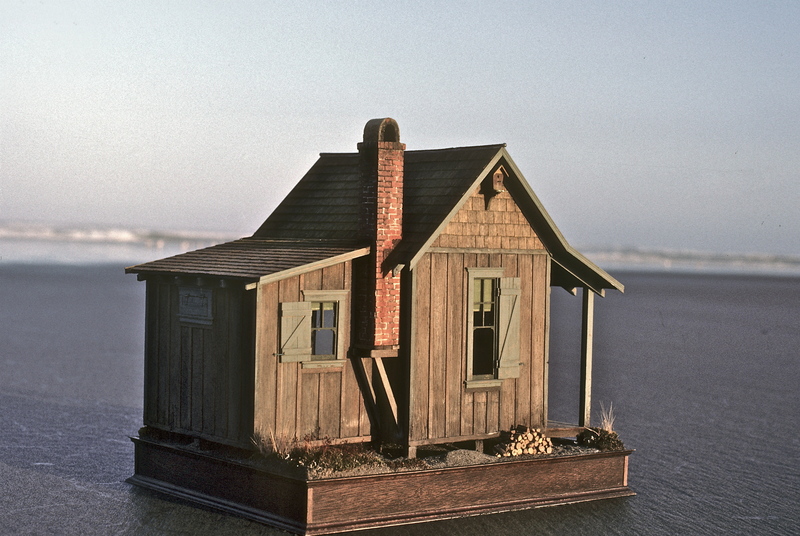 The Beach Cottage was project #37, built for the 1986 Guild School. 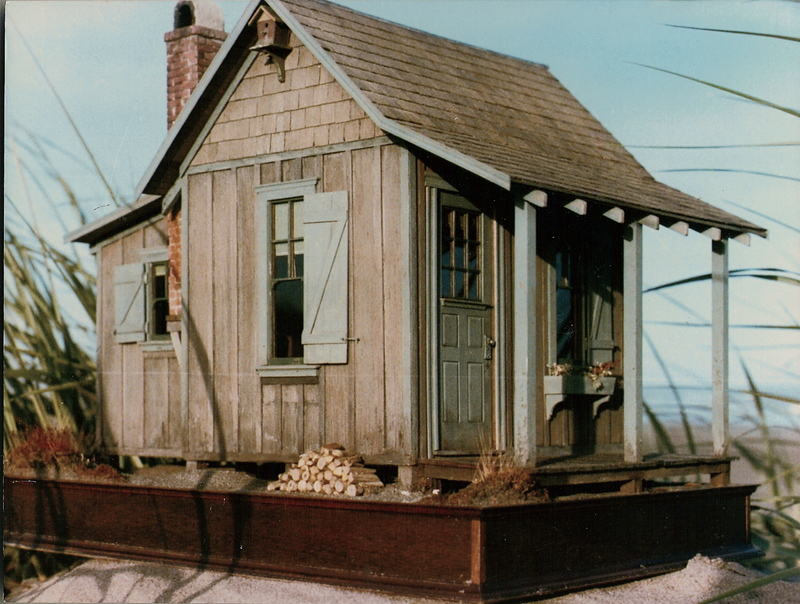 Noel took the basic design of the Garden Shed, turned it sideways, added a porch, a chimney, and turned out outer shed area into an enclosed second room, played with proportions, et voila!–a two-room beach guest cottage. Amenities would have been located in the outhouse, or one could sprint to the main house for something more civilized. One friend did alter her project, knocking through the back wall, shortening the bedroom depth, and adding a little bathroom. Like the Garden Shed, the exterior walls were board & batten (1/4”vertical battens over ¼” plywood walls), but this time without the time-consuming chevron detailing—there was plenty else to keep us busy. We considered shingling the walls, but decided that too was a time-eater, and we knew our supply of shingles was limited. 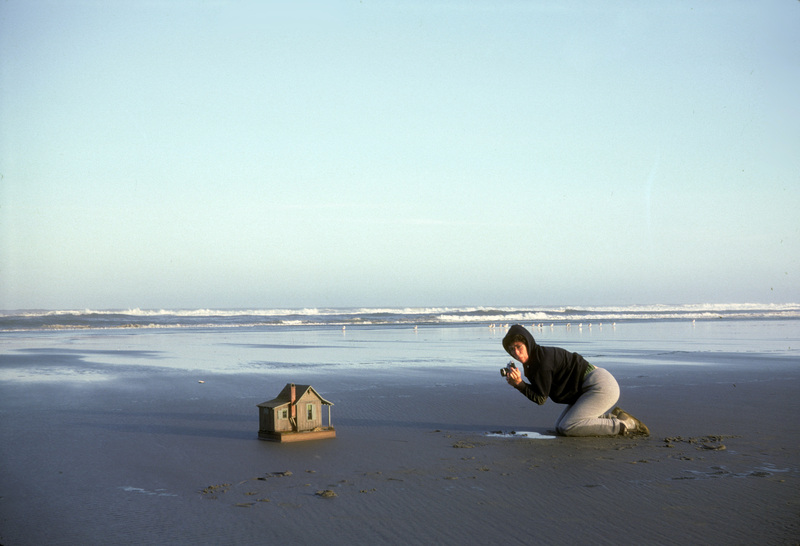 As with many beach houses in the area, including our own, the bottom of the chimney didn’t reach the ground. 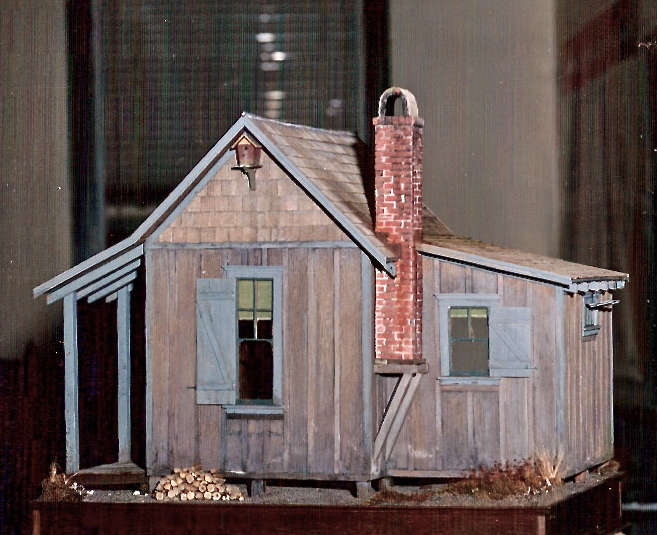 It was built on a little wooden stand, attached to the outer walls. Maybe it saved on brick, but I don’t know the real reason. Nonetheless, it made for an eye-catching detail on a miniature. 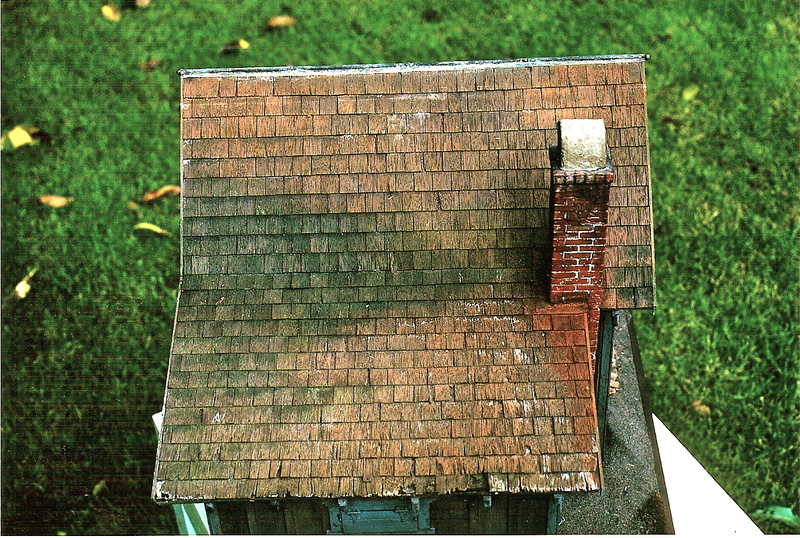 The rusted flashing was cut from our found rust collection, and the resulting rust stains on the roof were made with tube acrylics. The bricks are our usual vinyl floor tiles, individually cut, glued in place, and grouted with quick-patch cement. There’s a little curved cement cap on the top, to prevent downdrafts from the prevailing winds, just like the one on our full-size house. When we had a chimney fire the fire department chiseled off the whole cap, then replaced it when they were done—it weighed enough to stay put, and was removable for the chimney sweep (or future fire-fighters). The cap on the prototype was also removable for shipping, as it extended above the roofline, and bumped the top of the shipping box. I can’t think how many times I must have packed and unpacked that project, probably more than 20, and managed never to lose the cap. 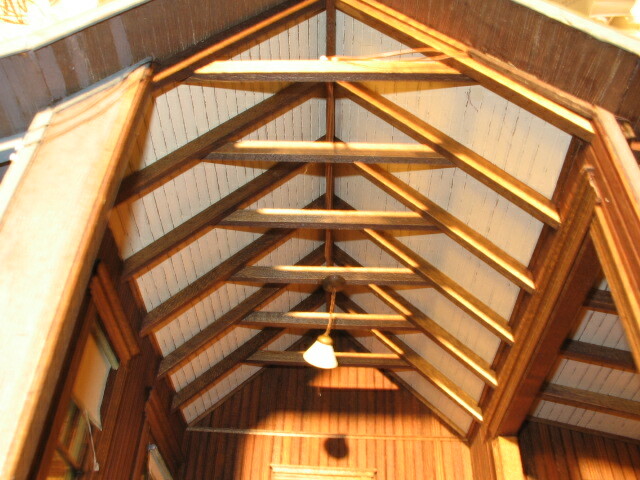 Regrettably, the roof always came at the end of the week, giving students minimal time to learn shingling and aging. After applying the shingles we wire-brushed them, and then went back with Exactos and needle-nose pliers to make them look weathered and in need of repair. The final step was painting in the moss (sap green transparent watercolor, dirt and rot (thin dirty water washes of raw umber, black acrylics) and some sienna for rust. That big dark spot we imagined had been shaded for years by a big evergreen. The flashing at the top was made from strips of rolled-out wine bottle lead, from the days before they decided it was unhealthy. No, there wasn’t time to drink all that wine–we had an “in” with the local fine dining establishment. Our classes only covered exterior finishing (no time! ), but students had diagrams and a materials list if they wanted to finish theirs like ours at home. Like our own house,our miniature had beaded, fir walls, narrow fir plank floors, and a faux beaded wood ceiling–we scribed the lines into the plywood ceiling, and painted it before it was attached to the walls. 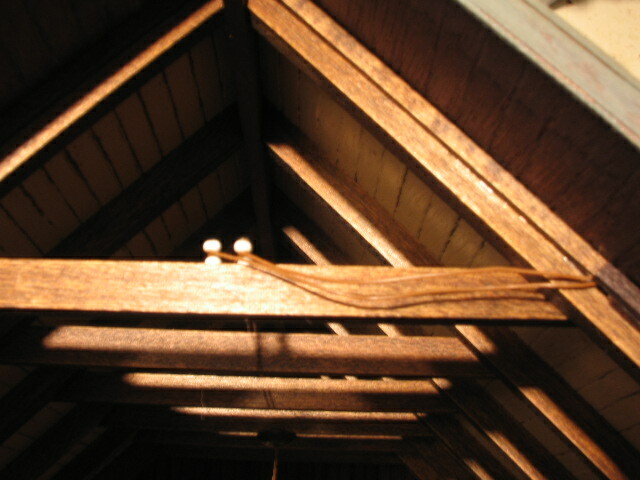 The woodwork was finished with McClosky’s Tungseal light and dark oak transparent stain–another wonderful product that didn’t make it into the 21st century. The window shades we made from old roller blinds we dug up somewhere, just a single turn around a dowel to suggest a whole roll. The rocker is one of George & Sally Hoffman’s early pieces, maybe the first miniature we ever bought. It became a photo prop for nearly every structure we made. Our classes were hectic, sometimes dubbed marathons. There was a lot to accomplish by week’s end, and students had a lot of new techniques to master in that short period of time. Plus, many had other classes and events to produce for, and everyone stayed up too late. It was impossible to finish during the class week, but we tried to make sure everyone had the skills to get to the end once they got home. I remember one student in that first class, Bea Ricks, a retired school teacher, sweet woman, one of those quintessential “granny” types with white hair wound around her head in a braid. About day three, Bea was having trouble with a technique—mullions, or bricks maybe, and we kept piling on new things to do. At some point I noticed she wasn’t in the room, and went looking. There she was, down the hall, silently crying into the wall—whoops! Bad teaching when the student cries! I felt awful. We talked for a while and she recovered, returning with a smile, and I learned to take it easier, not just on her, but everyone. That may have been the most valuable teaching lesson I learned—pace, how to keep it going without leaving bodies behind. The payoff was that she finished her project at home and won first prize at the Boston Miniatures Show that year. And she returned to take more of our classes. This entry was posted in Houses, Miniatures, People and tagged architecture, dollhouses, IGMA Guild School, miniatures, work style. Bookmark the permalink. Amazing! I just found you on a search for “beach cottage” and LOVE what I see. You are so talented and I’ve just had a ball looking at all of your beautiful images. 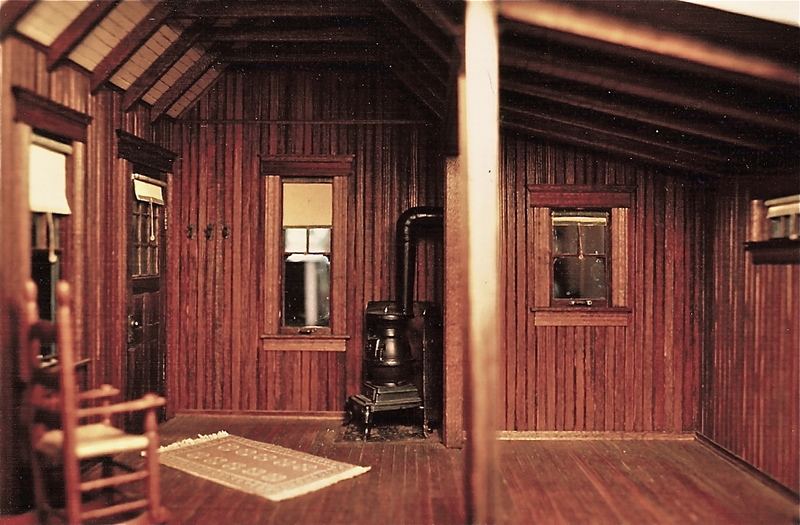 My Dad & I built a pretty good quality dollhouse together in the ’80s, mainly because I was obsessed with all of the miniature furnishings that could be found at a cool little shop near our home at the time – and the lighting that I saw used in so many ways. The dollhouse is currently in storage, waiting for when my daughter gets a bit older and we can resume work on it together. Your post on “why” and the miniature wheelbarrow caught my attention too – I love that you answered the “why” question with a photo on your iPhone! Happy to hear you enjoy the blog-I’m working on a new entry, so stay tuned. I agree that the availability of furniture is another good why for dollhouses.